Sunshine Coast Airport was recognised in the category for airports with fewer than 10 million passengers for performance and strong industry leadership during the last 12 months. Mayor Mark Jamieson said the acknowledgement by independent international aviation industry experts was very high praise for Sunshine Coast Airport. The award was accepted by Airport general manager Peter Pallot at a ceremony attended by airport and airline representatives from across Asia. Welcoming the announcement, Mr Pallot said the award was an incredible accomplishment and one he and the team were very proud of. “This is a fantastic achievement resulting from the hard work of our small and dedicated team. “We have worked hard to build strong and valued relationships with our airline and tourism industry partners to provide services that work for our community and ensure the success of our airport and our region. “To receive the 2017 CAPA Asia Pacific Small Airport of the Year award is an incredible honour. 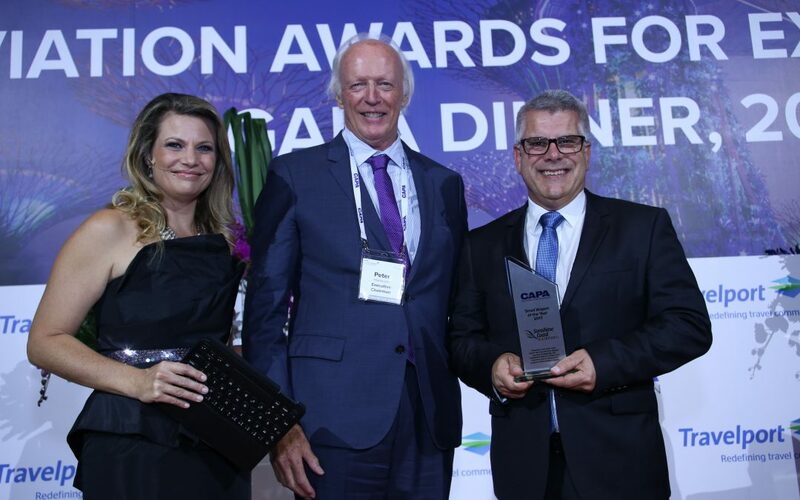 Photo: Sunshine Coast Airport General Manager Peter Pallot accepting the CAPA Asia Pacific Small Airport of the Year award in Singapore with CAPA Asia Pacific Aviation Summit gala dinner MC, Oriel Morrison and CAPA Executive Chairman, Peter Harbison.